Always wanted to be part of a community that works towards making the impossible a reality and a long-term volunteering stint lumped into one? This might be the avenue for you. Different Dragons (DD) is a dragon boat team for people with different disabilities to participate and compete in races, changing the mindset of the public by showing that while the paddlers may be different, they are not any less. That’s where you come in. Different Dragons need volunteers to support in trainings, helping paddlers with different disabilities to ace their paddling technique. Through it all, you also get to cultivate special long-term friendships with the entire team. 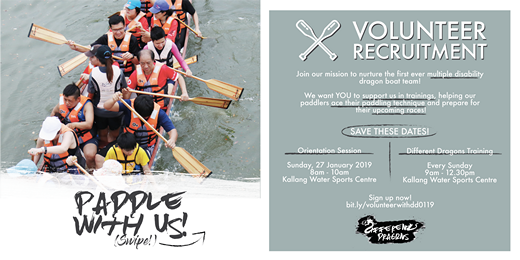 If you are the sporty-outdoorsy kind and dreams of getting that elusive golden tan, its all within your reach if you can commit every Sunday (or almost all sessions) from 3 February till 1 June, 09.00AM to 12.30PM at Kallang Water Sports Centre. *Prior experience in dragon boating is not required.